According to today’s New York Times, the apps that you have installed on your phone are passing along your location history to advertisers and others willing to pay up for this information. This probably doesn’t come as a surprise to most of our readers, but the quantity of data that is collected and how this anonymous data can be used to possibly identify you might. Take 46-year old math teacher Lisa Magrin. She is the only person that makes a daily 14 mile drive from upstate New York at 7am to the middle school where she works. 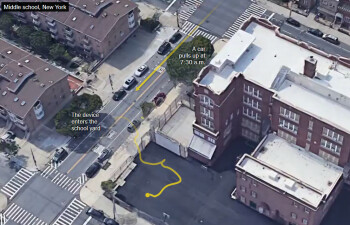 An app on her phone collected her location information sometimes as often as every two seconds. 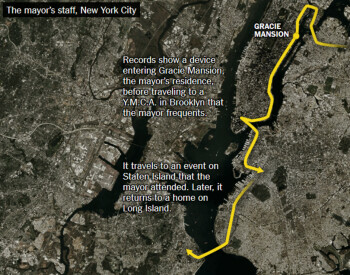 And while a database of more than a million phones compiled from this information did not mention her name, the Times was able to connect her to a trail of dots that mapped out the route she takes every morning. The dots were created from the data collected by the aforementioned app on her phone. She was also tracked to a Weight Watcher meeting, a dermatologist appointment and her ex-boyfriend’s house. The Times reports that at least 75 companies receive anonymous location data from apps that offer local news, weather and other types of information. These companies track as many as 200 million mobile devices in the states, and are able to know a person’s precise location within a few yards. This information is updated as many as 14,000 times a day. And while companies say that they are more interested in the patterns that the data presents, the truth is that someone working with the information could discover the person behind each anonymous dot. This can be accomplished by matching a phone to a particular address where it spent the night. Companies selling this data to advertisers took in an estimated $21 billion last year. This is why IBM purchased The Weather Channel’s apps. Those using these apps leave a trove of location data because they usually punch in their zip code to access their local forecast. And while these firms point out that the app users have enabled location services, the Times found that the wording that consumers see is in many situations misleading, or hidden away in very fine print. According to an executive at location company GroundTruth, Elina Greenstein, “We look to understand who a person is, based on where they’ve been and where they’re going, in order to influence what they’re going to do next.” The company owns an app called WeatherBug. The app does ask for user permission to collect location data and says that it will be used to provide personalized ads. Precise location data from users of this iOS app is sent to 40 companies, some of which said the data was unsolicited. The problem is that consumers want the services and information they receive from the apps that obtain and share location data. According to Brian Wong, the CEO of mobile ad firm Kiip, “You are receiving these services for free because advertisers are helping monetize and pay for it. You would have to be pretty oblivious if you are not aware that this is going on.” But as the Times points out, consumers are not properly alerted to this agreement that they are making. The Times says that Google and Facebook are the leaders in location-based advertising. Both say that while they collect data from their respective apps, they do not sell it to others. Apple and Google have both made changes to limit the use of collecting location data. For example, in the latest Android build, inactive Android apps can only collect location data a few times an hour. While that sounds like a lot of data being harvested, those apps used to collect this information continuously. Apple says that developers can use location data only to provide a feature for a particular app, or to disseminate ads that meet Apple’s guidelines. 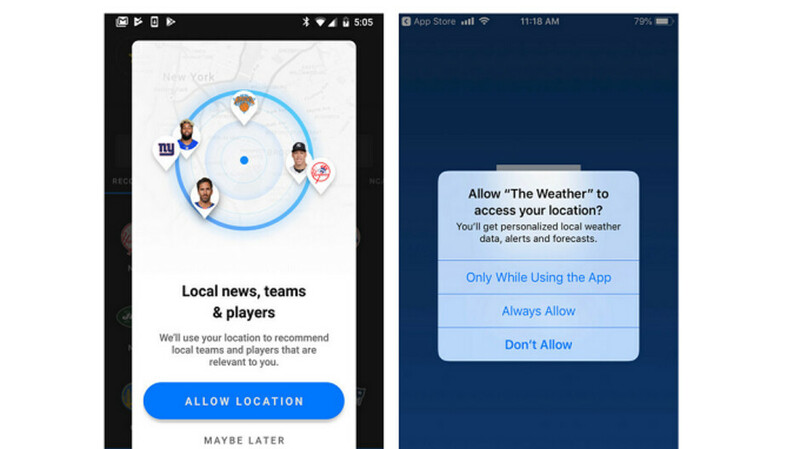 So smartphone users need to decide whether they are willing to give up their location data in return for the free services they receive from apps like theScore and The Weather Channel. Both apps ask for permission to collect your location data, but say that it is needed to provide personalized information. If you look at the images at the top of this article, you’ll see that neither app mentions anything about your location data being sold to advertisers or others.